to page eight' and we did it, though he wasn't the director." In the opinions of well-respected critics of mainstream US cinema (headed by Andrew Sarris whose book The American Cinema is perhaps most well known), there seems to be a truth universally acknowledged across the cinematic board. The number one film of all time, the one movie that regularly tops 'best of' lists is the work of the then twenty-six year old wunderkind, Orson Welles. Twenty-six! It genuinely shocks me every time his name is thrust forward and upwards on top of the illustrious heap, the pantheon of great filmmakers. If anyone created the perfect cinematic expression of his own art, it's this man (man is too small a word in all senses). But there was a problem with genius as Welles found out to his cost over a lifetime of artistic frustration. Citizen Kane's reputation, even in its own era, did Welles no favours. When your star explodes at such a young age, the rest of your life is just the debris falling to Earth. Orson Welles was a phenomenon in anybody's language. But genius could not flourish (or be funded) in 40s Hollywood so he had to prove to the powers that were that he was as good an actor for hire (albeit a 'king' actor incapable of being cast in secondary roles without significance) as anyone else out there. Problem was, he was still Orson Welles. I still vicariously feel that withering gaze that greeted Mike Nichols directing Welles in Catch 22. On day one, Nichols, set up his shot and apparently Welles just looked at Nichols and said "You're putting the camera there?" as if that square yard had just won the award for the most inappropriate place to shoot anything from at all. Ever. So the above quote from Joan Fontaine is indicative of Welles apparently taking artistic control whoever his director was. Let's add that in his wonderful three hour BBC Arena Interview in 1985, Welles dismissed a lot of quotes that were apparently attributed to him. Perhaps that one was apocryphal too. Between the truth and the legend, (in Welles' case) it was always "Print the legend." Jane Eyre director Robert Stevenson was no pushover but his oeuvre is full of live action Disney movies (he's most famous for Mary Poppins) so he probably won't be historically looked back upon as favourably as Welles was. 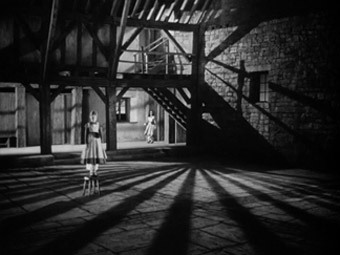 That said, the mise-en-scene of Jane Eyre reeks of Wellsian invention. Some of the arresting chiaroscuro sequences and shots (contrasts between light and dark) scream Welles' influence but whomever wore the riding trousers, brandished the whip and shouted into the bullhorn, the movie is still a small, compact marvel of adaptation. If I'm not mistaken, even the exteriors were interiors. This was quintessential studio filmmaking, Hollywood-style in the 40s – master craftspeople at work. Speaking of such masters, the score is also by a certain Bernard Herrmann. Its bombastic brass and sweeping dramatics are de rigueur for the age but this was before his scores got married to Hitchcock movies, two masters who complimented each other superbly well. That said, his sensitivity, particular in the final cue, is very much in evidence. The original story is well loved by filmmakers. No fewer than eighteen different versions have been produced since 1911. It can't be understated enough just how astonishing the book was seen at the time of its publication. Here was a girl and later a woman who knew her own mind, had an iron will, was buffeted by circumstances that would have broken lesser folk and had a morality made of steel. Every attempt to have her whipped into shape was met with defiance and in those days (the mid-1800s) women just didn't do that sort of thing. Acquiescence was default. Anything else was against the 'normal' way of things. Seen as a modern heroin now in 2011, it's easy to lose the significance of Jane's character and the power of its effect on audiences in the mid 19th century. The novel was a work that predated the Suffragette movement by a good fifty years. Charlotte Brontë's Jane Eyre follows the fortunes of an orphan Jane as told in her 'autobiography', detailing five distinct stages of her life – childhood, formal education, governess duties during which she's dramatically introduced to Edward Rochester, her time with the Rivers family (a down and out adventure that didn't make it to the screenplay) and her reunion with Rochester, the handsome but mysterious overbearing master of the Thornfield Estate. The movie opens with credits printed on a page-turning book. 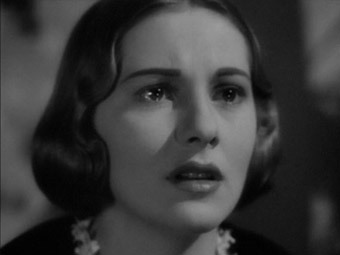 It settles on 'Chapter One' and Joan Fontaine as 'Jane' (one assumes) takes the voiceover duties. Now am I the only one to find this a curious start to a film of a beloved book? We start the movie on what everyone must presume is the first page of the novel. But it's nothing like the first page of the novel. It's a movie-written version of the novel, simplistic and somewhat trite. It's easily forgiven because most people won't be watching it with a copy of the well-thumbed novel on their laps (I do try to be familiar with the source material) but as Welles himself said many times, you must show no respect to the source at all – you're making a film not filming a book. Well, that marks a consistent start, disrespect wise. We're on Jane's side from moment one. I wonder how much of Jane Eyre subconsciously snuck into the Harry Potter oeuvre. Jane (the orphan) is adopted by her aunt (a wonderfully haughty performance by Agnes Moorhead) just as Harry is taken in by the Dursleys. I kept expecting her to conjure up her own magic with a twitch of the nose as I'd known her only from the 60s TV show Bewitched as Samantha's mother, Endora. In any altercation, Jane is always accused of lying while her aunt's ghastly own son (Dudley in Harry's universe) gets away with murder. Bereft of the smallest amount of kindness, Jane saves up all her hurt and flings it at her aunt the moment she is freed from her shackles. As is cliché now but perhaps then it was something of a novelty, any kindness comes from the poor, the downtrodden and the seriously ill. And like Lisbeth Salander in the Dragon Tattoo trilogy, Jane intensifies the smallest amount of kindness and respect until it makes her burst with happiness. This reminded me of Bill Bryson's canny observation about the British; they like their pleasures small. But as clichés go, frying pan and fire come to mind. Now Jane is taken to an institution, Lowood school, where her reputation, tarnished by the unfairness and wickedness of her aunt, leads her into the malign clutches of Mr. Brocklehurst, one of the more odious members of the cinematic clergy. You don't just love to hate him, you want him disembowelled over a month and dipped in salt to see if he can reach that high 'C'. How do people manage to brainwash themselves so thoroughly? Does no part of reason rear up and say "Hang on, I'm getting all this out of a book... Why should I be so unutterably cruel, just because the book says I should prepare the sinful for heaven, those whom I judge based on that bloody book again?" That's the 21st century talking but you know what I mean. It's near impossible not to feel for Jane with a terrible bully like that making her life one misery after another. And so, enter a little ray of kindness – in the case of the direction, the ray is a literal one in the gloom of the assembly hall of Lowood. The German expressionism cinematography influences are most obvious is these scenes. And if that little girl looks familiar, she should. The raven-haired angel is a third cinematic outing for a certain Ms. Elizabeth Taylor and she's heartbreaking. Close up of hands tell stark stories. At the end of her education, Jane emerges, butterly-like, from a determined, sympathetic little girl – very well played by Peggy Ann Garner – to the fine featured but just as resolute Joan Fontaine, an actress I have always admired since I first saw her in Hitchcock's Suspicion and Rebecca. She is well cast. Jane has to have an oxymoronic mix of steely vulnerability. That's a neat trick and Fontaine pulls it off with stillness and calm confidence. Yes, she's as pretty as a movie star but she plays 'plain' well enough. Remember, women were not raised to be like that a hundred and fifty years ago. She gets a position as a governess at Thornfield estate. And it's here that one of the written word's great characters emerges from the mist in the most dramatic fashion. The name Rochester, like Darcy and Heathcliff, has tremendous resonance in English literature. They have become men much larger than their descriptions on the page or reputation over their years of exposure. These prototypes are literature's Brando, Bogart and Dean except they never lived but live more now in the souls of people touched by their power than many real, breathing people you pass on the street without a second glance. Jane falls in the fog and a huge horse rears up in front of her. In a beautiful example of invisible stunt work and montage, we see the dog and horse struggling to get up from a near collision and horse rearing as a dark skinned giant looms up in front of Jane. "Apologies won't mend my ankle... Down Pilot!" he intones. Say hullo to Edward Rochester. The actor was not even in his 30s when he shot Jane Eyre and yet the 35 year-old character (an approximate age guessed at by Jane in the book) is brought to vivid life by one of the screen's greats as a huge commanding presence. It's over thirty minutes before Welles makes his introduction but his presence changes the movie's gear up a few notches. Rochester is everything that should clash with Jane and yet he too wears his vulnerability on his sleeve. He is unfailing in his regard for Jane's incisive opinions. It's as if someone has driven a stake through the movie because Jane's developing feelings for Rochester and the tragedy at the heart of his life pin the narrative down and affects everything that follow. The movie spins around this central mystery and draws out the revelations with a precious slow burn. Yes, there are enough changes to the novel to ask certain questions but adaptations are difficult beasts to pull off. To Robert Stevenson's credit (with a nod to Welles), his Jane Eyre is solidly crafted, exquisitely performed and if you like classic 40s Hollywood, this is a must. Presented in 4:3 black and white, the print, though a little sparkly with a fair few tramline scratches, stands up well. The blacks (so important in any Welles picture, directed by him or not) are well represented and Welles's beloved contrast doesn't white out the detail. The mono soundtrack, rendered in Dolby Digital 2.0, is clear and relatively hiss-free. There are blocky subtitles on offer but that's it. Jane Eyre is a worthy melodrama with solid performances and a striking direction and production design. As a great example of classic 40s Hollywood filmmaking, it stands near the top of the pile. 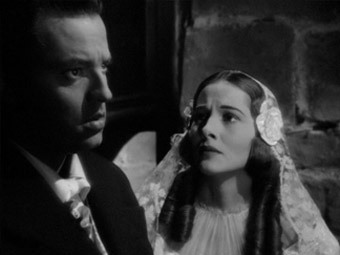 Terrific performances by both Fontaine and Welles make Jane Eyre well worth a nostalgic wallow.